The company's CEO was misquoted saying Trump supporters should "take their business elsewhere." PURCHASE, NY: PepsiCo is facing a boycott of its brands after fake news stories about the company's CEO have circulated on social media. Twitter users have been sharing articles from sites like the Conservative Treehouse, Truthfeed, and the Gateway Pundit that misquoted PepsiCo CEO Indra Nooyi as saying that Donald Trump supporters should "take their business elsewhere." The misinformation began with the Conservative Treehouse, a blog that falsely quoted Nooyi's interview at The New York Times Dealbook Conference on November 10. The post, published a few days later, featured the headline "Massive stewardship fail—PepsiCo CEO tells Trump supporters to take their business elsewhere." The post calls for readers to sell their Pepsi stock, but doesn't go on to quote Nooyi saying those exact words. The Conservative Treehouse's news post cited Nooyi's interview with The New York Times, which was also shared on YouTube. The PepsiCo CEO did express her disappointment with the election results, saying that her daughters and some of her employees were in "mourning," but also encouraged reconciliation. "The election is over," she said. "I think we should mourn, for those of us who supported the other side. But we have to come together and life has to go on." She even congratulates Trump on his election win. The fake news sites, however, picked up the Conservative Treehouse's headline, sharing the false quote, "take their business elsewhere." The stories propelled people to threaten a boycott of all Pepsi brands, including Starbucks, Mountain Dew, Lays, and Fritos, using the hashtags #boycottPepsi and #Pepsiboycott. PepsiCo declined to comment. 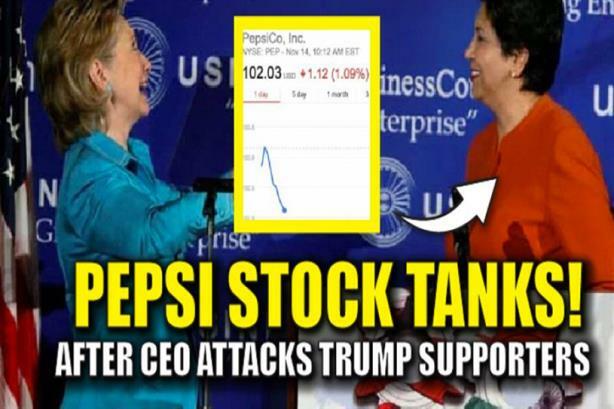 Truthfeed and the Gateway Pundit also falsely reported that PepsiCo's stock fell 5% as a result of Nooyi's comments at the conference. According to CNNMoney, Pepsi's stock price fell 3.75% on the day of Nooyi's interview. However, it is true that over the course of November, PepsiCo stock has decreased by 5.21%, according to CNNMoney's data calculations. People are even calling for a boycott on brands PepsiCo used to own, like Pizza Hut, Taco Bell and KFC, now owned by Yum Brands. PepsiCo sold Yum Brands, formerly known as Tricon Global Restaurants, in 1997. Actor James Wood, who has a following of 482,000 on Twitter, also encouraged the boycott on Twitter, and even called out restaurants that serve Pepsi, like Applebee's, Panera, IHOP, and Arby's. The photo in the tweet is from a Business Insider chart that details which chains serve which soda. The boycott has spread to Reddit, where a list of brands that Trump fans should reject and others that should be supported has been posted to r/vote_trump, described as the "unofficial Donald Trump 2016 subreddit." PepsiCo is the first company on the "Organizations to Boycott" list, followed by brands like Macy's, GrubHub, Oreos, Dreamworks, and Netflix. For the past week, Facebook and Google have been highly criticized over how fake news on their platforms might have influenced Donald Trump winning the election. A BuzzFeed report on Wednesday found that fake news sites outperformed real news from media organizations such as The New York Times in the week before the election on Facebook. According to the report, 20 of the top-performing fake news articles generated more than 8.7 million shares, while 20 of the top-performing real news sites received more than 7.3 million shares. Both tech companies said they would update their policies to address fake news. On Monday, Google said that it would ban these sites from using its online advertising service, and Facebook updated its policy to say that it would also exclude fake news sites from its advertising platform. And PepsiCo isn't the only brand to be attached to a fabricated story. Athletic shoe company New Balance found itself in a PR nightmare after Matthew LeBretton, the company's VP of public affairs, told The Wall Street Journal last week that "The Obama administration turned a deaf ear to us and, frankly, with President-elect Trump, we feel things are going to move in the right direction." Many sites turned that quote into stories that said the New Balance CEO said the brand was the "official brand of the Trump revolution" and the "official shoes of white people." Soon after, people who were anti-Trump began to boycott the brand, and some even set its shoes on fire. The Boston-based company said the comments were taken out of context and has since posted on social media that the brand does not "tolerate bigotry." So your brand is the victim of fake news. Now what?